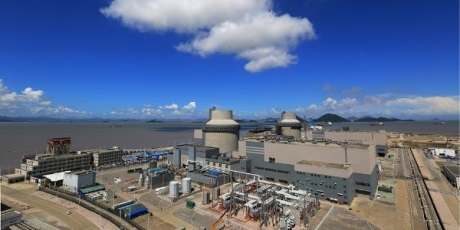 The loading of fuel assemblies into the core of unit 1 of the Sanmen nuclear power plant in China's Zhejiang province began today following the issuance of a permit by the country's nuclear regulator. The unit is later this year expected to become the first Westinghouse AP1000 to enter operation. Westinghouse said China's National Nuclear Safety Administration (NNSA) issued the permit after Sanmen 1 successfully completed all the necessary functional tests, as well as technical, safety and Chinese regulatory reviews. The fuel loading permit was presented to China National Nuclear Corporation subsidiary CNNC Sanmen Nuclear Power Company Limited at a ceremony in Beijing today by Liu Hua, vice minister of Ecology and Environment and Director of the NNSA. In a statement the NNSA said that, before the first loading of materials, it had conducted a six-year safety review of the Sanmen 1 project and dispatched on-site supervisors for the entire construction process. The project meets the design safety goals and the construction quality is good, it added. The loading of the first of 157 fuel assemblies into the core of Sanmen 1 began promptly. Westinghouse noted, "The fuel loading process will be followed by initial criticality, initial synchronisation to the electricity grid, and gradual power ascension testing, until all testing is safely and successfully completed at 100% power." In September 2007, Westinghouse and its partner the Shaw Group received authorisation to construct four AP1000 units in China: two at Sanmen and two more at Haiyang in Shandong province. Hot testing of Sanmen 1 was completed on in June 2017 and it is expected to be the first AP1000 to begin operating later this year. Haiyang 1 and Sanmen 2 are also expected to begin operating by the end of this year, with Haiyang 2 expected to start up in 2019. Four AP1000 reactors were also being built in the USA - two each at Vogtle and Summer. However, construction of the two Summer units was suspended in August. Westinghouse President and CEO José Gutiérrez said, "Today we have reached a tremendous milestone for Westinghouse and our AP1000 plant technology. This is the next step in delivering the world's first AP1000 plant to our customer and demonstrating the benefits of our advanced passive safety technology to the world."